Nolan has somewhat shot himself in the foot. We're all expecting a mind-bending, dream-within-a-dream of a narrative in each of his films, but how much further can he go? The answer is space. Interstellar is his most ambitious film to date. And for Nolan that's saying something. It starts off simply (and slowly) enough. Matthew McConaughey plays Cooper, an adventurous and free-spirited father and former NASA pilot, living on a farm with his two children and father. On this near future Earth, humanity is on the brink of extinction, forced into space exploration to find a new home. Cooper soon gets sent across the universe on such a mission, incorporating worm holes, singularities, time dilation and more. It's science-fiction to the core - where Inception was a unique concept, Interstellar is based on scientific theory with theoretical physicist Kip Thorne employed to ensure realism. It's arguably a more intelligent film, its internal logic transcending the film into actual scientific study, though it's equally less entertaining - a cerebral experience rather than an action thriller. The comparisons to Kubrick's 2001: A Space Odyssey are palpable, not least for the grand scale, but for the inclusion of an A.I character, ground-breaking special effects, often beautiful design, and Hans Zimmer's shudderingly epic orchestral score that quite literally shakes the room with its imposing church organ. This is a film that demands to be seen in the cinema. Through its mesmerising symphonic structure and expansive narrative that tackles some demanding scientific and philosophical questions, this is less a space odyssey and more a space opera. At times, Nolan stumbles over his own ambitions. He's a director who seems to delight in confusing his audience, the film perhaps purposefully and unnecessarily obtuse. A post-film Wikipedia search provides a lucid narrative based on sound concepts, but in practice some key points are not always well explained or presented on screen. The film's climax in particular feels far-fetched, demanding we suspend our disbelief one step too far though it's certainly a clever idea. The film's major error, though, is in the sound department: through McConaughey's sibilant, mumbling voice and a high proportion of lines muffled by space helmets and/or the score, too many plot points are lost, leaving the audience inexcusably baffled. Beyond the science, the core story demonstrates the gravitational pull of human relationships across the boundaries of time and space - for all the film's scientific bombast, there remains a huge emotional payoff. The success of the film, then, is equally down to the performances. McConaughey plays a convincing hero and Anne Hathaway's fellow scientist Brand is an appropriate foil, plus the likes of Michael Caine and Matt Damon give excellent performances. It's the superb and underrated Jessica Chastain as Cooper's adult daughter Murph who provides the emotional crux of the film; following in her father's footsteps as the real heroine, her story ensures the film delivers on an emotional level. Interstellar is ultimately a flawed film: it's not as grand as 2001, not as satisfying as Inception and not as visually powerful as last year's Gravity. It remains, however, one of the cinematic events of the year. It's powerful, it's intriguing and will have you googling scientific theory before the credits are over. 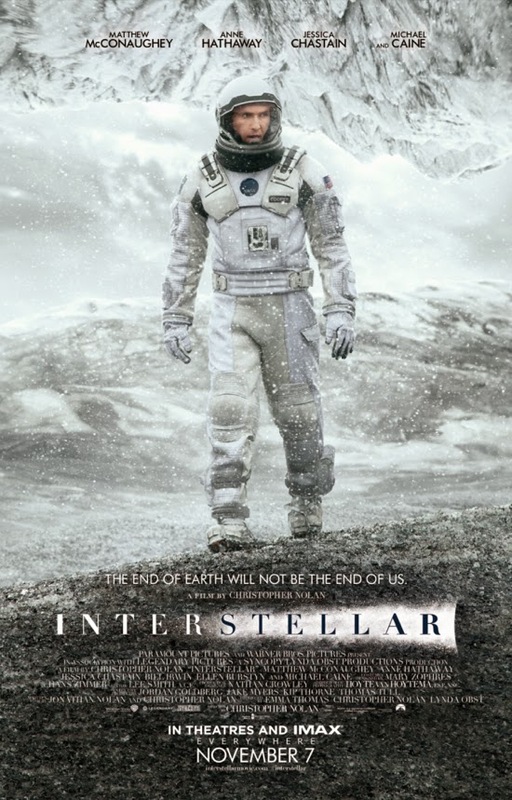 Watch: Interstellar is out now.